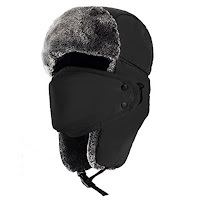 Grab this black trapper hat for ONLY $5 with Amazon.com Prime and a code from the gleam at bottom of blog post. UNISEX FITMENT - One size ﬁts most, ideal for 22 inches to 24 inches head circumference. The windproof mask attaches to the hat with two snap buttons on either side,which can be removed easily and stow away when not in use. The ears and chin are highly sensitive to cold weather, and must be protected from wind and frost,and the Mysuntown Winter trooper helps to do just that. The hat is suitable for men and women, and also for all kinds of winter wear. Good Quality and Comfort, Choose Mysuntown, Choose the Best Trooper Hat.